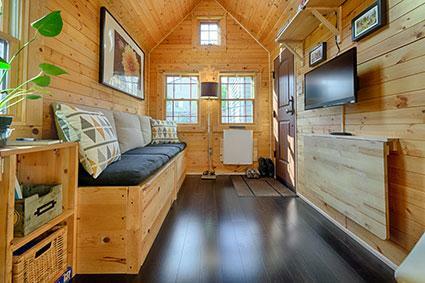 Living in a tiny home isn't just about the size of your house. It's a commitment to downsize useless or unnecessary items in your home and let go of the things you don't really need or love. 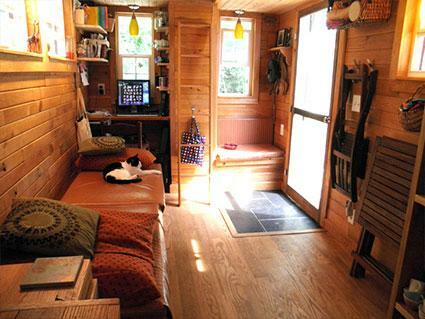 Tiny house living is an intense lifestyle change to a simpler, more cost-effective way of living. With less clutter, the small accents and details added to a tiny home make it irresistibly charming and welcoming. The downsized cost of building a tiny home enables most owners to customize the interiors with choice materials from floor to ceiling. Tongue and groove wood paneling is a popular option for walls and ceilings that typically contain numerous windows to help brighten the small space inside. Painting both walls and ceiling panels in light hues of white, cream, light sage green or light, muted shades of blue adds a feeling of spaciousness. A background of light, natural wood tones is also conducive to a soothing, comfortable color scheme that easily ties the home in with the natural surroundings outdoors. Neutral background colors provide a unified feel to shared living spaces individually defined by different, coordinating colors on furniture and accents. Glossy hardwood planks installed on the floor blend seamlessly with the wood grain patterns on the walls and ceiling, regardless of a darker or lighter finish. With an all wood interior, accent colors of green and blue inspire a natural, earthy vibe. For an atmosphere with a little more excitement, use bold complementary colors such as blue and orange or red and green -- neighboring jewel tones such as amethyst, turquoise and sapphire look stunning combined on fabrics and glass accents. You can also mix warm and cool colors by using analogous colors or those that sit next to each other on the color wheel such as orange, yellow and green. If you prefer more of a subdued, Zen-like feel, muted earthtone colors on accessories fit perfectly with a natural wood backdrop. Accent colors and patterns used on decorative accessories bring character and warmth to a tiny home. The key to creating a coordinated color scheme of two, three or even four colors is to keep the saturation, tone or intensity the same or similar. Pick up an inexpensive color wheel at an arts and crafts store to help sort out tints, tones and shades, tertiary colors (yellow-green, red-orange, blue-green) and ways of combining colors you may have never thought of before. You don't have to play it safe with an all-neutral color scheme just because your home is small. If you love bright colors, you can find a place for them on some of your decorative accents. Be very selective and only include what you need or really love in your tiny home to avoid an over cluttered look with decorative accessories. Less is more when adding those final touches. Some homeowners opt to add character to their tiny homes with bright colors on exterior paint, trim, doors or inside a recessed wall nook. Personalization is a key decorating element in a mini mansion that can only hold a limited number of decorative accents. 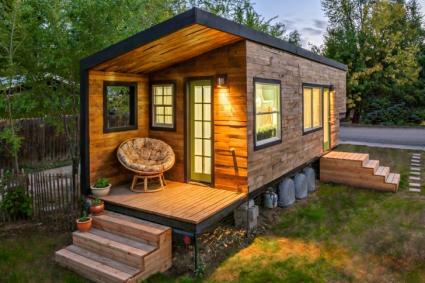 Tiny homes come in dozens of architectural styles, from quaint little English, Victorian or country style cottages, rustic log cabins, miniature farm houses and modern, angular home designs. Similar to a standard size home, the architectural design of a tiny home tends to influence the decorating style inside. The geometric shapes of a modern tiny home influence interiors with clean lines, lots of natural finishes, neutral colors and minimal accessories. Tiny home owners are also free-spirited decorators, inciting an eclectic, Bohemian vibe with exotic accents like Moroccan lanterns and colorful Indian textiles. Transitional styles can also be found in tiny homes where industrial style light fixtures and corrugated steel wall panels share the same space with rustic, reclaimed wood flooring and contemporary prints or patterns on fabrics and upholstered cushions. Keeping a clean, minimalist look where everything has a place helps tie it all together. Whether you're working with a builder or have a carpenter in the family, be sure to include furniture and architectural features that perform double duties in small spaces. Built-in benches and seating areas along walls or inside nooks provide excellent options for hidden storage with hinged seats that open into hollow spaces. A folding table installed on the wall can serve as both a dining table and home office desk. A narrow staircase leading up to a second story loft provides additional, cleverly designed storage space with built-in drawers underneath the steps. Built-in shelving underneath a staircase can serve as an interesting bookcase for storage and a few decorative knickknacks. Toe-kick drawers installed under closets or cabinets make use of every inch of available space. To avoid clutter on counters and limited floor space, install shelving and open cubbies on unused wall space. 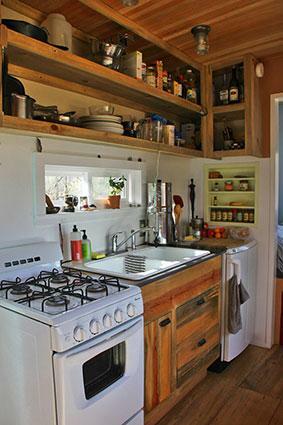 In the kitchen, open shelving provides quick access to dishes, drinking glasses or frequently used cookware. A small recessed wall nook with a spring green back wall makes a quaint little spice rack. Wall shelves also serve the double duty purpose of storage and decorative displays. Add some of the following items among books or other small items being stored. Incorporate some of your accent colors with ceramic pottery, colored glass bottles, candles or freshly picked flowers growing in your garden or a forest meadow serving as your backyard. Silk flowers can provide a similar, cheerful ambiance when fresh flowers are unavailable. Houseplants poised on shelves and window ledges help recycle the air and refresh the space with greenery. 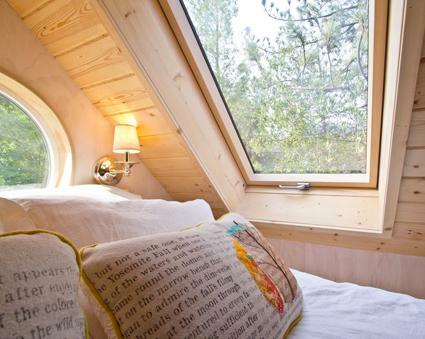 The main or master bedroom in a tiny home is almost always located in a second-story sleeping loft. A skylight installed in the ceiling brings in plenty of natural light during the day as well as fresh air when opened. At night you can enjoy stargazing or moonlight at certain times of the month. If the loft gets too warm during the summer months, a solar shade can cut down on the heat while still allowing soft light to enter the space. Cover the bed (usually consisting of a thick, futon-style mattress or air mattress) with a plush comforter or quilt and plenty of cushions and pillows for a comfy retreat. Wall mounted light fixtures serve as bedside lamps and provide soft accent lighting at night. A small basket can be used to hold reading material or personal items such as eyeglasses, a tablet or smartphone. Make good use of a small porch or deck by creating an outdoor living space that can be decorated as you desire. French doors that swing outward transition indoor/outdoor living spaces without taking up any additional floor space inside. Depending on the size and how you plan to use your outdoor room, it can be furnished with a small patio table and chairs for al fresco dining. Chairs and benches covered with comfortable cushions provide an additional conversation area, a quiet place to read or to soak in a spectacular outdoor view. A few planters filled with plants or flowers add a personal, welcoming touch. 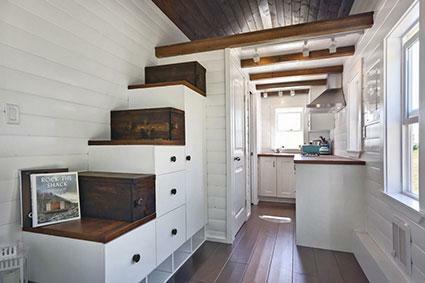 The biggest challenge with decorating a tiny home is knowing how to keep it simple and not over clutter the space. If you can master the art of organization and accent your home in moderation with decor you truly love, your home will surely reflect it.